Hello! It's been a while since I've done any circle lens review; come to think of it, it has been more than a year since I did one. I purchased quite a few circle lens during the past year but I really didn't have the time to review those. Today, I will be reviewing the G7 Barbie T501 Circle Lens courtesy of Klenspop - they have kindly sent this circle lens for review. The G7 Barbie T501 Circle Lens is one of Klenspop's bestsellers, which was the main reason why I chose the product to review when Klenspop asked which lens I would want. I was wondering what made this lens so special that it is one of their bestsellers. The pair of lenses came with a travel case and a small bottle of contact lens solution and for first time buyers and contact lens users, this is a really good package. The bottle of lenses came inside a small box packaging with a window cutout in which you can preview the bottle. I actually find this really cute and a big plus to the company. It has been the first time that I have received lenses packaged so nicely. Usually, the bottles would just be tightly encased with bubble wrap and it isn't really that exciting to open them, but this pair came in a box and that was reinforced with bubble wrap for safe mailing. The lens case that lenses came with is so adorable. It is a light green plastic case with a mirror inside and plastic safety lens tweezer. The tweezers make it easier to pick up the lenses from the case and arrange it on the fingertip, helps reduce the transfer of dirt and prevents rips. Personally I don't find this necessary at all since I am so used to just using my fingers to arrange my lenses on my fingertip and I always make sure that my hands are clean before handling my contact lens. Using the tweezers is a matter of preference but I think this would be helpful to those who have long fingernails and always have a difficulty of taking lenses from their cases or if you are just a newbie at using contact lens. I have stated this in my previous circle lens review, circle lenses should in no way be a replacement for conventional contact lenses because usually they have lesser oxygen permeability (allows your eyes to breathe) and as a result your eyes become tired and dry easily. Although I have reiterated this several of times, I have to be honest with you guys that circle lenses has been part of my daily life. I cannot stand conventional contact lenses since they are thicker and more uncomfortable to wear. Moving on to the actual review, the G7 Barbie T501 in Brown is really comfortable to wear and looks very natural even if it immensely creates a dolly effect. As you can see in my eyes on the photo below, the design of the circle lens doesn't really show up on me since I naturally have dark brown eyes and the color of this particular lens is not light enough to show the color. If you want a dramatic effect or bright eyed look, this particular lens shade is not for you. If you have noticed, most circle lens designs usually appear pixelized if you look really close but this one appears so natural and it doesn't even look like I'm wearing circle lenses at all. 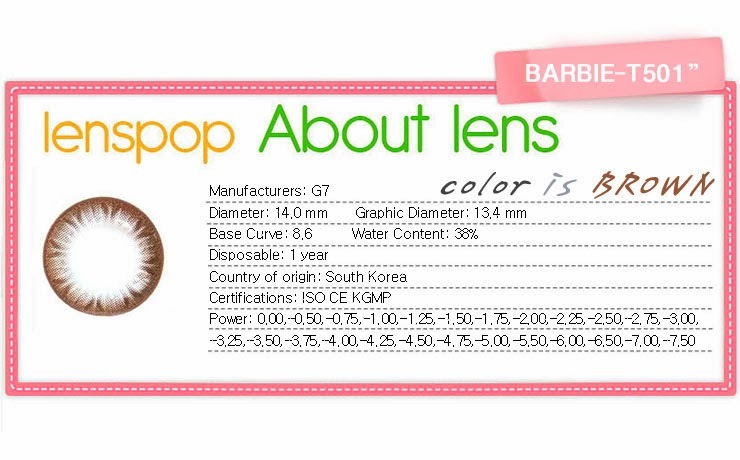 I can definitely see why the G7 Barbie T501 Circle Lens is popular among all the other circle lens that Klenspop markets. I'm only giving it 4 out 5 for design just because that it can't really be seen on my eyes but other than that I'm very happy with this particular pair of circle lens. It enlarges my eyes a lot and as you can see above, you can only see a little of the whites of my eyes and the lenses has pretty much taken over. ^^ It also gives off a very innocent look which I quite like.